About 90 times the size of an average gummy bear, the ORIGINAL Giant Gummy Bear!™ packs a wallop of monstrous taste! Available with or without a stick, this made in the USA treat is 4” x 2 ½” and approximately ¾ pound. 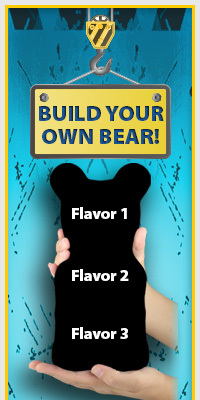 The Giant Gummy Bear!™ is available in the same “custom” flavors as the World’s Largest Gummy Bear!™ Choose your favorite and enjoy!